Record number of houses listed for sale in Prince Edward County in May. May was another good news month for buyers of priced over $300,000. Listings were up 78% from May 2017 to 330, representing with a record number of houses listed for sale in Prince Edward County. Sales were only up a modest 7% from a year ago. The last time there was anywhere near this number of listings was in June 2015 when there were 290 such homes listed. 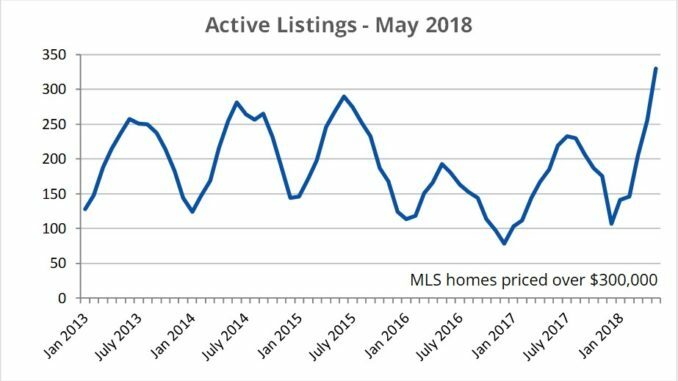 Despite the flood of listings, the listing to selling price ratio stayed at 98%, close to its all-time high of last year. Before the bubble market last year, County homes sold on average for 95-96% of listing price. Home continued to sell quickly in May, staying on the market for an average of 26 days. This up slightly from 23 days a year earlier. However, even at an average of 26 days on market, homes sold quick by the County’s historical standard. In 2015, house stay on the market an average of 74 days before selling. With listings way up and sales largely unchanged, conventional economics says that homes should sell slower and for less money. This is not what’s happening right now. For an insightful discussion of why this might be happening, see a this recent analysis by John Pasalis.